One of the first and most important things that I wish someone had shown me was the proper moisture content in a piece of leather. Having it properly dampened, having just the right amount of moisture in a piece of leather, determines how well your tools react. It determines how much color and the burnish you get out of your leather. Getting the right amount of moisture in it is critically important. In leatherworking, we refer to the dampening process as casing the leather. 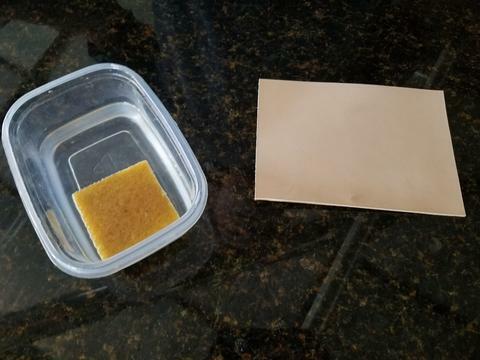 When I case my leather, I use just regular water with a sponge. You want to avoid kitchen sponges because often they have soap added to them when they are manufactured, but other than that, really any sponge will do. What I try to do when I first initially wet down a piece of leather is dampen it so that the moisture gets maybe halfway through that piece of leather. It is important that you don’t start working with it right away. When you let the leather start to return to its original color, that’s usually when it will work the best. Then you’re ready to start cutting in your design. I usually only apply moisture to the grain (smooth) side of a piece of veg tanned leather. Applying moisture to both sides often results in your leather being too wet. Leather that is too wet will take cuts and impressions easy enough, but cuts will want to close up and stamp impressions will not be crisp. Leather that is too wet will usually not give you that rich burnish in the impressions. The result is a design that lacks crispness and detail. Leather that is too dry will be difficult to cut and cuts will not open up nicely. Your swivel knife will feel like it is dragging rather than gliding smoothly through the leather. Impressions will take a lot of force to get any depth and while they may have a little burnish, they will not have the rich color that they should. 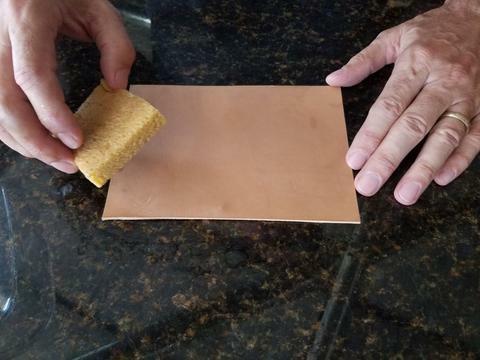 As you do more leather carving, you will learn to recognize these signs and learn how to keep your leather at that perfect moisture content that gives great results. 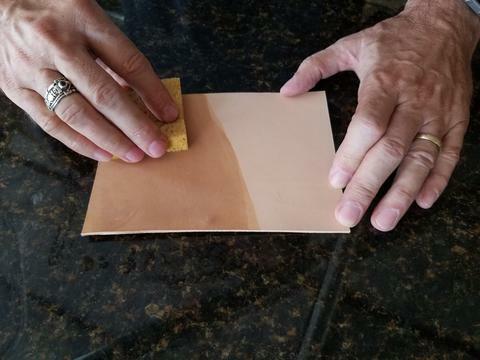 Another common question is “How do I know when I need to re-wet my leather?” Generally, I let the leather tell me since everything from humidity to elevation can impact the rate at which the leather dries out. Some people have different theories or techniques for figuring out if the leather needs to be re-moistened, however, I’ve found what works best for me is to look to see if the cuts are opening up like I want them to and if my tools are getting a good burnish. If not, the leather may either be too moist or too dry. This is something that you’ll get better at determining the more and more you work with leather. To learn more, watch the video below: “Leathercraft Tips for Beginners with Jim Linnell”. Thank you Jim. As you say “wish someone would have shown me sooner” All you tips are so greatly appreciated! The total length of the knife in this video looks shorter than I remember learning the knife should be. That is placing the bottom of the yoke at the bottom of your middle finger, blade should then come to where your hand meets your wrist. What is your suggestion? Thank you for your question, we reached out to Jim and below is his response. Hope this helps! Swivel knives have been made in a variety of sizes and lengths over the years. These differences have developed to satisfy the requirements of the people using the knives. In the video, I am showing you the swivel knife I have used for the last 30 plus years and the way I hold it to get the results I like. This is also the way that Al Stohlman shows how to hold it in his instruction books. When someone is first getting used to using a swivel knife, learning how to properly hold it so that you can control what it does, is one of the first important lessons they need to learn. As they do more lather carving, they will adjust their grip so that it best suits them, just as we all have. The grip certainly will change based on the length of the swivel knife you use. Today, most are adjustable in length, but over the years, they have been made in all sizes. Next PostNext Where We’ve Been. Where We Are. Where We Are Going.